Hello! We got our kitty at the pound when he was 4-5 months old, so I have no way of really proving he is a RagaMuffin. But I do believe the picture of him says it all! He is about 8 years old. We keep him on a leash because I can't stand the thought of losing him or anyone taking him. He is the cutest, furriest, most talkative overstuffed "kitten" with the hugest yellow eyes. We love him to pieces! Hi Lacey and Donnie... I absolutely agree with you. Shadie has purebred written all over him! He has a black smoked coat - very glamorous. Wow , Shadie is really beautiful. Oh Shadie is so lovely! His coat is beautiful! and those eyes! No wonder you worry about losing him. I also have fears and dreams about losing my own cats so I know what you mean. Merrily so sorry to hear about Snowball, how awful. 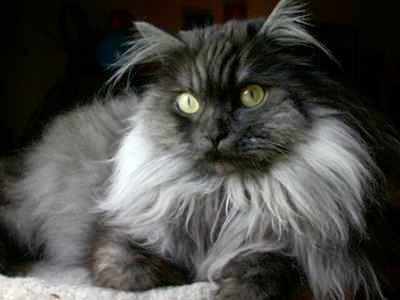 What a beautiful cat! Such stunning eyes. He looks so majestic. What a wonderful snuggling companion. WOW !! What a beautiful boy, and those golden eyes, hard to believe these cats end up at the pound. One thing in your post has me worried.... When I was five years old, my grandmother rescued a beautiful white cat, who other than coat color was just like your cat. She loved him dearly and kept him on a leash teathered to a tree, so he wouldn't get lost. One day I went out to see Snowball, and he was hanging from the tree, dead. He had climbed up onto a branch and lost his footing. Hopefully you are talking about him being on a leash when you take him for walks,but I have to admit reading your post gave me a chill, and memories from so many years ago. Please never leave your boy unattended on a leash.